"Personal information" is information that is associated with your name or personal identity. The types of personal information you provide to us may include name, address, phone number, e-mail address and credit card information. 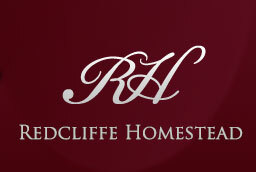 Once you choose to provide us with personal information, you can be assured it will be used only to support your customer relationship with Redcliffe Homestead. We take seriously the trust you place in us. We will not sell, rent or lease your personal information to others. "Non-personal information" is data gathered from our Guest Satisfaction Survey Forms that is not associated with a specific personal identity. Redcliffe Homestead will collect and analyse this non-personal information in order to improve our service, environmental performance and marketing strategy. Redcliffe Homestead is committed to protecting the privacy needs of children and we encourage parents and guardians to take an active role in their children's online activities and interests. Redcliffe Homestead does not knowingly collect information from children under the age of 13 nor target its website to children under 13. Redcliffe Homestead uses your personal information to provide you with accommodation services and to help us better understand your needs. Specifically, we use your information to help you complete a transaction, to communicate with you and to provide you with a memorable accommodation experience. Credit card information is used only for payment processing and fraud prevention. Credit card information will not be kept longer than necessary for providing the services. Non-personal data is aggregated for reporting about Redcliffe Homestead's performance. It is used to improve the guest experience. to protect the personal safety of Redcliffe Homestead employees and third parties on Redcliffe Homestead property. Redcliffe Homestead is committed to protecting the information you provide us. To prevent unauthorized access or disclosure, to maintain data accuracy, and to ensure the appropriate use of the information, Redcliffe Homestead has in place appropriate physical and managerial procedures to safeguard the information we collect. We use Secure Sockets Layer (SSL) encryption when collecting or transferring sensitive data such as credit card information. SSL encryption is designed to make the information unreadable by anyone but us. This security measure is working when you see either the symbol of an unbroken key or closed lock (depending on your browser) on the bottom of your browser window. Redcliffe Homestead mostly uses "session" cookies, which are removed from your computer once you leave the website. These are used so our service can remember that you have logged in already and prevent you doing so more frequently. The technology we use (PHP), requires the use of session cookies. Session cookies expire and are deleted after 30 minutes of no activity on the website.